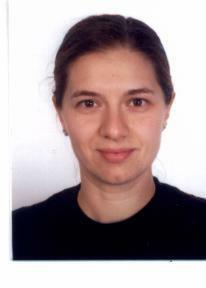 Born in 1979, Elisabetta Collini obtained her BSc and PhD degrees in Chemistry at the University of Padova (Italy) where she is presently Associate Professor and PI of the ERC Starting Grant QUENTRHEL. She is also involved in two Collaborative projects funded by EU, in which she serves as Local Coordinator. Her main research interests are focused on the study and characterization of nonlinear properties and excited state dynamics of multichromophoric systems with particular attention to energy transfer processes. Her research activity, proved by several papers published in high impact journals, was recently awarded with national and international awards (“G. Borgia” prize in Chemistry from the Accademia Nazionale dei Lincei; “Donne Talento ed Innovazione” prize from the M. Bellisario Foundation; “P. Levi” prize in Chemistry from the Italian Chemistry Society; European Young Chemist Award 2012 (gold medal) from EuChem, “M.B. Ceolin” prize from the University of Padova). 1. E. Collini, G.D. Scholes, Science, 323, 369, 2009. 2. E. Collini, C.Y. Wong, K.E. Wilk, P.M. G. Curmi, P. Brumer, G.D. Scholes, Nature, 463, 644, 2010. 3. E. Collini, F. Todescato, C. Ferrante, R. Bozio, G.D. Scholes, JACS, 134, 10061, 2012. 4. E. Collini, Chem. Soc. Rev., 2013, 42, 4932. 1. E. Collini, C. Ferrante, R. Bozio, J. Phys. Chem. B, 109, 2, 2005. 2. E. Collini, C. Ferrante, R. Bozio, Mater. Res. Soc. Symp. Proc. Vol. 846, D.D.2.7.1, 2005. 3. E. Collini, C. Ferrante, R. Bozio, A. Lodi, G. Ponterini, J. Mater. Chem., 16, 1573, 2006. 5. E. Collini, C. Ferrante, R. Bozio, J. Phys. Chem. C, 111, 18636, 2007. 6. E. Collini, S. Mazzucato, M. Zerbetto, C.Ferrante, R. Bozio, M. Pizzotti, F. Tessore, R. Ugo, Chem. Phys. 7. R. Signorini, C. Ferrante, D. Pedron, M. Zerbetto, E. Cecchetto, M. Slaviero, I. Fortunati, E. Collini, R.
Bozio, A. Abbotto, L. Beverina, G.A. Pagani, J. Phys. Chem. A, 112, 4224, 2008. 9. E. Collini, G.D. Scholes, Science, 323, 369, 2009. 10.E. Collini, G.D. Scholes, J. Phys. Chem. A,113, 4223, 2009. Systems” in Energy Transfer Dynamics in Biomaterial Systems, Eds. I.Burghardt, V.May, D.A. Micha, and E.R. Bittner, Springer Series in Chemical Physics, Vol. 93, Springer Verlag, Heidelberg/Berlin, 2009, pagg. 3-34. 12.E. Collini, C.Y. Wong, K.E. Wilk, P.M. G. Curmi, P. Brumer, G.D. Scholes, Nature, 463, doi:10.1038, 2010. 13.E. Collini, I. Fortunati, S. Scolaro, R. Signorini, C. Ferrante, R. Bozio, G. Fabbrini, M. Maggini, E. Rossi, S. Silvestrini, PCCP, 12, 4656, 2010. 14.I. Fortunati, E. Collini, E. Garbin, I. Ros, F. Todescato, R. Pilot, C. Ferrante, R. Signorini, R. Bozio, Nonlinear Optics & Quantum Optics, 40, 115, 2010. 15.E. Collini, S. Carlotto, C. Ferrante, R. Bozio, A. Polimeno, J. Bloino, V. Barone, E.Ronchi, L. Beverina, G. A. Pagani, PCCP, 13, 12087, 2011. 16.F. Todescato, I. Fortunati, S. Gardin, E. Garbin, E.Collini, R. Bozio, J.J. Jasieniak, G. Della Giustina, G.Brusatin, S.Toffanin, R.Signorini, Adv. Funct. Mater. 22, 337, 2012. 18.G.D. Scholes, E.Collini, C.Curutchet, Abstr. Pap. Am. Chem. Soc., 237, 155, 2012. 21.E. Collini, F. Todescato, C. Ferrante, R. Bozio, G.D. Scholes, JACS, 134, 10061, 2012. 23.E. Collini, Chem. Soc. Rev., 2013, 42, 4932. (invited tutorial review). Studio di proprietà ottiche non lineari e dinamica di stato eccitato di sistemi multicromoforici (i.e. complessi antenna biologici, polimeri coniugati, aggregati molecolari) con particolare attenzione alla caratterizzazione di processi di trasferimento di energia e carica per applicazioni in light-harvesting e organic electronics.